Comparative Rater with Policy Management | CCiComputer Services, Inc. Capture the power of CCiRater and enter a new world of superior rating and policy management that turns time wasting jobs into simple, efficient tasks. Give your producers the power to be more productive and make your agency more competitive. CCiRater comparatively rates: Automobile, Homeowner, Dwelling, Mobile Home, and Motorcycle. CCiRater is more than just a rater! It also includes a full-featured policy manager (better than many stand-alone policy management systems) and costs less. 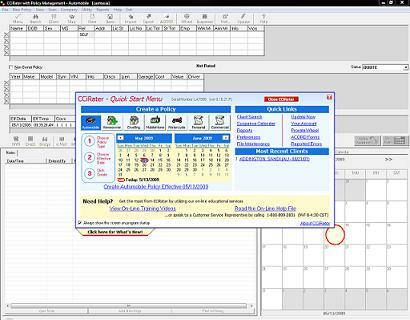 CCiRater stores client quotes and policies, includes a Client Contact Log and Agency Suspense Log, and produces comprehensive reports that will keep you on top of your business. All of this at a very affordable price. CCiRater is available in Alabama, Florida, Georgia, Louisiana, and Mississippi, other states coming soon…call us!